NASA's long-running Mars rover Opportunity is getting ready for the harsh Martian winter, but this year for the first time in its nearly eight-year history needs a sunnier location to continue its work. NASA said the rover, which depends on solar power for energy, is sitting just south of Mars' equator and has worked through four Martian southern hemisphere winters. Being closer to the equator than its now defunct twin rover, Spirit, Opportunity has not needed to stay on a Sun-facing slope during previous winters but now its solar panels carry a thicker coating of Martian dust than before. The dust makes it necessary for Opportunity to spend the winter at a Sun-facing site where the rover can tilt its power panels northward about 15 degrees for maximum solar exposure, NASA stated. Dust has long been one of the biggest challenges for the Mars rovers as huge dust storms are common on Mars. In one particularly bad storm in 2007 NASA wrote that the dust in the Martian atmosphere over Opportunity was blocking 99% of direct sunlight to the rover, leaving only the limited diffuse sky light to power it. Before the dust storms began blocking sunlight last month, Opportunity's solar panels had been producing about 700 watt hours of electricity per day, enough to light a 100-watt bulb for seven hours. When dust in the air reduced the panels' daily output to less than 400 watt hours, the rover team suspended driving and most observations, including use of the robotic arm, cameras and spectrometers to study the site where Opportunity is located. One day the output from Opportunity's solar panels dropped to 148 watt hours and the next day fell even lower, to 128 watt hours. NASA said it has selected a piece of Red Planet real estate called Greeley Haven an outcrop of rock on Mars recently named informally to honor Ronald Greeley, Arizona State University Regents' professor of planetary geology, who died October 27, 2011. "Greeley Haven provides the proper tilt, as well as a rich variety of potential targets for imaging and compositional and mineralogic studies," said Jim Bell, lead scientist for the Panoramic Camera (Pancam) on the rover in a statement. "We've already found hints of gypsum in the bedrock in this formation, and we know from orbital data that there are clays nearby, too." Opportunity, which landed on Mars January 24, 2004 has driven a total of 21 miles (34 kilometers). 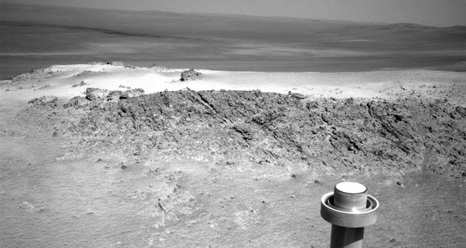 The rover last summer arrived at the rim of Endeavour Crater, an ancient crater 14 miles wide. Endeavor is of interest to scientists because NASA's Mars Reconnaissance Orbiter satellite has shown the crater to have clay minerals and older geological deposits, the space agency stated. Clay minerals, which form exclusively under wet conditions, have been found extensively on Mars from orbit, but have not been examined on the surface, NASA said.